Cartoonist Darryl Cunningham has kindly agreed to be interviewed by the Frontier Psychiatrist blog. 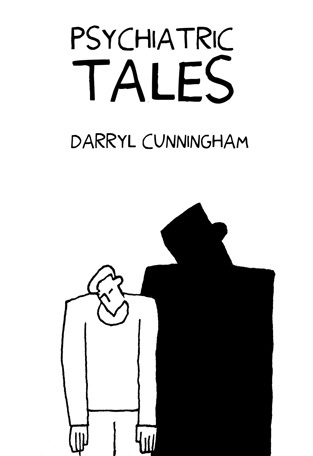 Darryl has recently published his graphic novel ‘Psychiatric Tales‘, which I throughly recommend. It was recently reviewed in the Observer and seems to be doing very well. Darryl’s own blog is called Darryl Cunningham investigates. See the end of this post for further links. You’ve just had your graphic novel "Psychiatric Tales" published in the UK. Can you tell us about it? 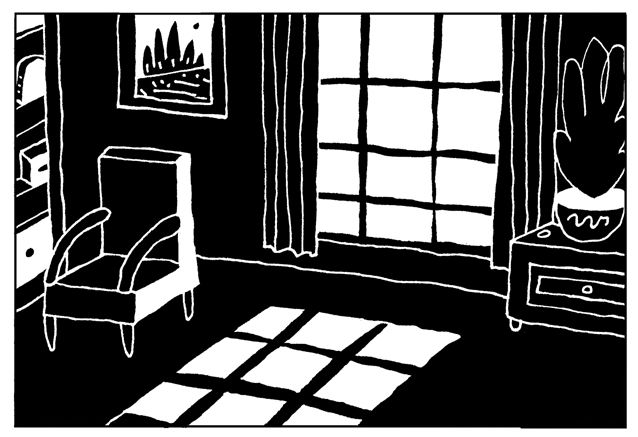 Psychiatric Tales is a collection of eleven graphic stories about mental illness. Drawn in a stark black and white style, reminiscent of woodcuts. Subjects he book covers include schizophrenia, bi-polar disorder, depression, anti-social personality disorder, dementia, and self-harming. Psychiatric Tales is a book that attempts to demythologise mental illness. Forget what you’ve seen in movies or on TV. This book shows what the experience of mental illness actually is for both patients and the staff who treat them. Media representations of people who suffer mental illness tend to be appalling. We live in an age where racism and sexism is considered unacceptable. Yet the mentally ill are still thought fair game for ridicule and are subject to the worst kind of prejudice. The book is out in the UK from Blank Slate publishing. It will be published in the US by Bloomsbury early next year. I’m aware that the subject matter of graphic novels has broadened a lot in recent years but psychiatry isn’t the most obvious topic. Can you tell us about what lead you to the subject? I worked as a health care worker on an acute psychiatric ward for many years, and throughout that time I kept a diary, thinking that the material might lend it self to a book. However I’ve always been a cartoonist, always drawn for pleasure and had a few things published in the 90s. It seemed natural to me to start drawing up these stories into comic strip form. It was when I began putting these chapters online, that I realised I had a success on my hands, due to the incredibly positive response I had from people. What struck me whilst reading it was how suited the format was for exploring psychiatric issues in an unsensational but compelling way. What do you think that the advantages of a graphic novel treatment are? The comic strip form is very immediate. It’s an easy to read medium in which you can present a lot of information. It’s combination of words and pictures. What could be more powerful than that? By the time you’ve decided not to read it, you’ve already read half of it. It’s a superb educational tool. It’s clear that one of your aims with the book was to properly inform your readers about mental illnesses. Why do you feel drawn to do this, and do you think that a book like this would have been useful to you whilst you were experiencing mental health problems of your own? After a few years as a health care assistant, I decided that if I was going to drag myself out of the minimum wage trap and have any kind of a life, then I should become a trained psychiatric nurse. I had to do a year’s night course, at a local college, just to get the qualifications that would get me onto the nursing course in the first place. This I did alongside my health care job. I bit off far more than I could chew. Two years into the nursing course, and with only one year to go, I found that I could not continue. I began to struggle with terrible anxiety and depression. I had always suffered a certain amount of anxiety in the job, but I’d managed to deal with it. As the last year of the course began, I became completely overwhelmed with feelings of despair and hopelessness. Thoughts of death and suicide haunted me. I ran up huge debts, not caring whether I could pay them off or not. I had to leave the course. I’d invested so much time and effort into becoming a psychiatric nurse, but in the end it had all come to nothing. I was devastated. In the aftermath of all this, and while I was putting myself back together, I began to look again at much of the old comic strip work I’d done in the years prior to the nursing course. The internet had arrived by then and this gave me a direct line to a new and bigger audience. The story strips that had the largest impact were the ones written about my psychiatric ward experiences. These strips developed a life of their own, being picked up all over the internet, on sites such as Digg, Boing Boing, The Comics Reporter, and many others. This lead to Blank Slate offering to publish the stories. Well I didn’t have many strips done at this time. I hadn’t even looked at them for four years. So I began drawing more in order to have enough for a book. This process helped dig me out of depression and gave me a new direction and a future. I don’t know whether a book like Psychiatric Tales would have helped me much during my depression, but writing and drawing it certainly did. Can you tell us about some of the reactions your book has received from service users? I had an e-mail from a young man who intended to buy two copies of the book when it came out. One for his mother, and one for his step-father. He wanted to show his family that the bipolar disorder he’d been diagnosed with, was a real illness, and that he needed their understanding not hostility. Lots of readers have told me that the book had moved them to tears. It’s very gratifying to have created something that has such a powerful effect. You’ve worked in mental health care for long periods in the past – what was your experience of psychiatrists? Good and bad. As a group psychiatrists are the same as everyone else. I’ve met brilliant and effective psychiatrists, I’ve met arrogant psychiatrists, I’ve met useless psychiatrists, and I’ve even met psychiatrists who were clearly not well themselves.You seem to be broadly supportive of the treatments on offer, and those who are on both sides of the patient-healthcare professional divide. There are other people, some of whom read this site, whose experience of mental health services is quite negative. What are your feelings about how we could improve what we do? I’m so pro-psychiatry that I’m aware that I have a terrible bias towards it. So when psychiatry and mental health care is criticised I tend not to want to listen. We all have to be conscious of our bias and understand how our investment in the status quo might distort our thinking. It’s very human to be this way, but it doesn’t have to be so. Service users would benefit greatly if those in the health care professions would listen more. Some of readers of this blog won’t be too familiar with graphic novels, especially ones about mental health. Can you recommend a few titles? 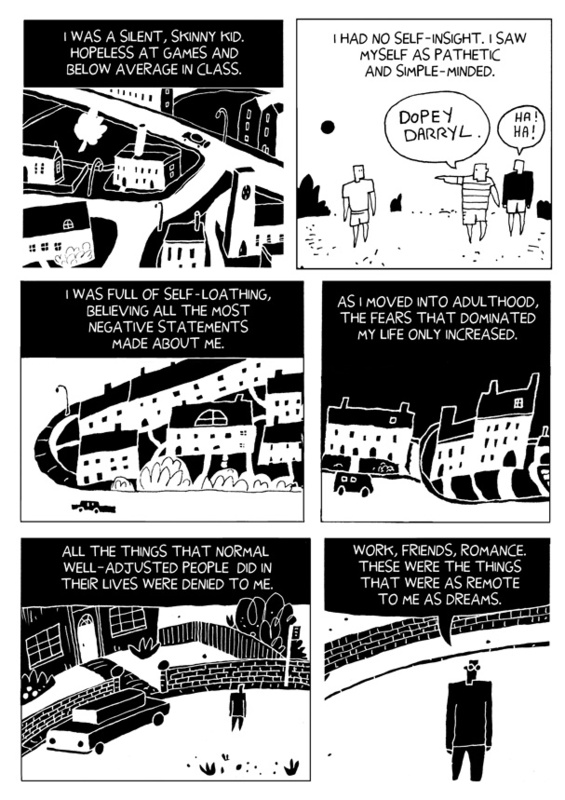 Recently there was a conference in London called Graphic Medicine, which looked at the ways in which the comic book narrative form could help both service users and professionals. There is a list on the site of medical themed graphic works. This entry was posted on Sunday, August 8th, 2010 at 9:39 am	and is filed under Books Films Television. You can follow any responses to this entry through the RSS 2.0 feed. You can leave a response, or trackback from your own site. 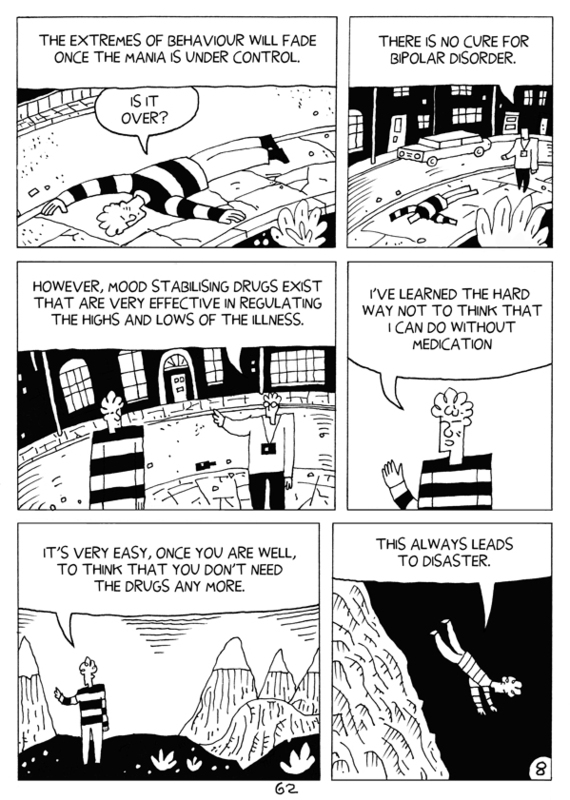 I think his strip on schizophrenia is very well told up to the point he makes about the thread of cause and effect being difficult to follow. Then it turns into an advert for treatment. My guess is the author has some positive experiences of treatment he wishes to get accross. As he says, we should be aware of our bias. I found the sections I’ve read of Darryl’s book to be very moving and honest. I’ve never read a graphic novel before and have only just realised how great the potential for exploring complex issues in this way. Darryl’s experiences of psychiatry were good. Mine were bad. Medication helped Darryl. Medication made my problems much worse. Inevitably, then, we see things somewhat differently. For example, when I come across sentences such as “This always leads to disaster” (re stopping drugs) I find myself mentally altering “always” to “sometimes”. I was a little saddened that he tends not to want to listen when psychiatry is criticised, but, yes, as he says, we all have to be conscious of our bias. Different experiences lead us to different views, but, hopefully, we can all learn something from each other. Darryl is a talented cartoonist and writer who has tackled difficult issues skilfully in this thought-provoking book. I wonder how many of the mad, murdering schizos written about in tabloids are acting under the influence of, or withdrawing from, major neuroleptic or SSRI anti-depressant medication prescribed to them by their psychiatrists. I challenge Darryl to draw a strip about the (unproven of course) link between seroxat and aggression. Thanks for this. We need more of this kind of thing. I’ll definitely try to pick up a copy.